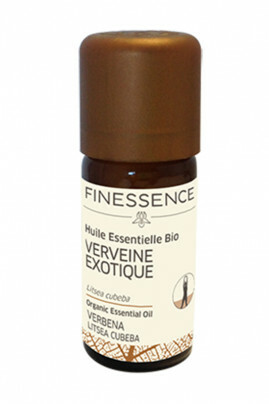 The Finessence Organic Exotic Verbena Essential Oil is renowned for its digestive properties. Also known as lemony beds, it helps digestion and relieves bloating. Very useful after a rich and hearty meal! Thanks to its calming properties, it facilitates sleep and offers a restful sleep. Its lemony scent pleasantly perfumes your interior while sanitizing the atmosphere. In massage, the Finessence Organic Exotic Verbena Essential Oil soothes and tones the painful or inflamed areas like heavy legs. Atmospheric diffusion : Pour a few drops into your diffuser of essential oil. Respect the dosage and diffusion time indicated in the manual of your device. Cutaneous application : In a spoonful of vegetable oil, add 4 drops of essential oil. Mix and massage at the place concerned. Infusion : Dilute 3 drops on a piece of sugar and add it in 1 liter of lukewarm water. A natural concentrate of exotic verbena for a moment of relaxation! Litsea cubeba (may chang) fruit oil, citral*, limonene*, linalool*, geraniol*, citronellol*. May be fatal if swallowed and enters airways.Causes skin irritation. May cause an allergic skin reaction. Causes serious eye irritation. Toxic to aquatic life with long-lasting effects.